All papers listed here are refereed publications available by searching the Astronomy database of the SAO/NASA Astrophysics Data System (ADS). The papers listed include those that present scientific results which have made use of data obtained with SOFIA and (denoted by an asterisk, with independent numbering) all the other papers, including those about the observatory and the instruments. Papers about SOFIA intruments published in SPIE Proceedings are available on the individual instrument pages. If you are an author looking for information regarding proper acknowledgements for the use of SOFIA data or appropriate citations, please see the Information for Authors page. PhD theses discussing SOFIA data, instrumentation, or the observatory are available on the PhD Theses page. 145. "Studying the Evolution of Warm Dust Encircling BD +20 307 Using SOFIA"
Thompson, Maggie A., et al., 2019, ApJ, 875, 45. 144. "Surveying the Giant H II Regions of the Milky Way with SOFIA. I. W51A"
Lim, Wanggi, De Buizer, James M., 2019, ApJ, 873, 51. 142. "The SOMA Radio Survey. I. Comprehensive SEDs of High-mass Protostars from Infrared to Radio and the Emergence of Ionization Feedback"
Rosero, V., et al., 2019, ApJ, 873, 20. 141. "HAWC+/SOFIA Multiwavelength Polarimetric Observations of OMC-1"
Chuss, David, et al., 2019, ApJ, 872, 187. 140. "A Small Molecule with PAH Vibrational Properties and a Detectable Rotational Spectrum: c-(C)C3H2, Cyclopropenylidenyl Carbene"
Agbaglo, D., et al., 2019, ApJ, 871, 236. 139. "Disruption of the Orion Molecular Core 1 by Wind from the Massive Star θ1 Orionis C"
138. "Velocity profiles of [CII], [CI], CO, and [OI] and physical conditions in four star-forming regions in the Large Magellanic Cloud"
Okada, Yoko, et al., 2019, AAP, 621, A62. 137. "A Search for Water Vapor Plumes on Europa using SOFIA"
Sparks, W., et al., 2019, ApJL, 871, 1. 136. "SOFIA Far-infrared Imaging Polarimetry of M82 and NGC 253: Exploring the Supergalactic Wind"
Jones, Terry, et al., 2019, ApJL, 870, L9. 135. "SOFIA/FORCAST Resolves 30 - 40 μm Extended Dust Emission in Nearby Active Galactic Nuclei"
Fuller, Lindsay, et al., 2018, MNRAS. 134. "A SOFIA Survey of [C II] in the M51 Galaxy: [C II] as a Tracer of Star Formation"
Pineda, Jorge, et al., 2018, ApJL, 869, L30. 133. "Jet-related Excitation of the [CII] Emission in the Active Galaxy NGC 4258 with SOFIA"
Appleton, P. N., et al., 2018, ApJ, 869, 61. 132. "High-resolution SOFIA/EXES Spectroscopy of SO2 Gas in the Massive Young Stellar Object MonR2 IRS3: Implications for the Sulfur Budget"
Dungee, Ryan, et al., 2018, ApJL, 868, L10. 131. "Infrared Detection of Abundant CS in the Hot Core AFGL 2591 at High Spectral Resolution with SOFIA/EXES"
Barr, Andrew G., et al., 2018, ApJL, 868, L2. 130. "Magnetic Field Uniformity Across the GF 9-2 YSO, L1082C Dense Core, and GF 9 Filamentary Dark Cloud"
Clemens, Dan, et al., 2018, ApJ, 867, 79. 129. "SOFIA FIFI-LS Observations of Sgr B1: Ionization Structure and Sources of Excitation"
Simpson, J. P., et al., 2018, ApJ, 867, L13. 128. "Gemini, SOFIA, and ATCA Reveal Very Young, Massive Protostars in the Collapsing Molecular Cloud BYF 73"
Pitts, Rebecca L., et al., 2018, ApJL, 867, L7. Andrews, H., et al., 2018, A&A. 126. "SOFIA Mid-infrared Observations of Supernova 1987A in 2016 — Forward Shocks and Possible Dust Re-formation in the Post-shocked Region?" 125. "The Close AGN Reference Survey (CARS): SOFIA Detects Spatially Resolved [C II] Emission in the Luminous AGN HE 0433-1028"
Busch, G., 2018, ApJL, 866, L9. 124. "High Spectral Resolution Observations toward Orion BN at 6 μm: No Evidence for Hot Water"
Indriolo, Nick, et al., 2018, ApJL, 865, 2. 123. "Diagnostic Value of far-IR Water Ice Features in T Tauri Disks"
Kamp, I., et al., 2018, A & A, 617, A1. 122. "Anatomy of the massive star-forming region S106. The [O I] 63 μm line observed with GREAT/SOFIA as a versatile diagnostic tool for the evolution of massive stars"
Schneider, N., et al., 2018, A&A, 617, A45. 121. "Velocity-resolved [O i] 63 μm Emission in the HD 50138 Circumstellar Disk"
Sandell, G., et al., 2018, ApJ, 864, 2. 120. "SOFIA/FORCAST Observations of the Luminous Blue Variable Candidates MN 90 and HD 168625"
Arneson, Ryan A., 2018, ApJ, 864, 31. 119. "SOFIA/HAWC+ Detection of a Gravitationally Lensed Starburst Galaxy at z = 1.03"
Ma, Jingzhe, et al., 2018, ApJ, 864, 60. 118. "Astrophysical sulfur in diffuse and dark clouds: The fundamental vibrational frequencies and spectroscopic constants of hydrogen sulfide cation (H2S+)"
Morgan, James W., 2018, MNRAS, 480, 3483. 117. "The Nature of Molecular Cloud Boundary Layers from SOFIA [OI] Observations"
Langer, W. et al., 2018, A&A. 116. "Unveiling the remarkable photodissociation region of Messier 8"
Tiwari, M., et al., 2018, A&A, 615, A158. 115. "C+ distribution around S 1 in ρ Ophiuchi"
Mookerjea, B., et al., 2018, A&A, 616, A31. 114. "Dust Production Rates in the Fomalhaut Debris Disk from SOFIA/FORCAST Mid-infrared Imaging"
Adams, J.D., et al., 2018, ApJ, 862, 161. 113. "Temperature and Para Hydrogen Gradients on Jupiter Observed from the FORCAST Camera on SOFIA"
Conrath, Barney J., et al., 2018, Icarus, 315, 1. 112. "The Highly Polarized Dusty Emission Core of Cygnus A"
111. "A Thorough View of the Nuclear Region of NGC 253: Combined Herschel, SOFIA, and APEX Data Set"
Pérez-Beaupuits, J. P., et al, 2018, ApJ, 860, 23. 110. "The Emission and Distribution of Dust of the Torus of NGC 1068"
Lopez-Rodriguez, Enrique, et al., 2018, APJ, 859, 99. 109. "The Temporal Development of Dust Formation and Destruction in Nova Sagittarii 2015#2 (V5668 SGR): A Panchromatic Study"
Gehrz, R. D., et al., 2018, APJ, 858, 78. 108. "New Measurements of D/H on Mars Using EXES Aboard SOFIA"
Encrenaz, T., et al., 2018, AAP, 612, A112. 107. "Searching for Cool Dust. II. Infrared Imaging of The OH/IR Supergiants, NML Cyg, VX Sgr, S Per, and the Normal Red Supergiants RS Per and T Per"
Gordon, Michael S., et al., 2018, AJ, 155, 212. 106. "Unveiling the Chemistry of Interstellar CH. Spectroscopy of the 2 THz N = 2 ← 1 Ground State Line"
Wiesemeyer, H., et al., 2018, A&A, 612, A37. 105. "Velocity Resolved [C II] Emission from Cold Diffuse Clouds in the Interstellar Medium"
Goldsmith, Paul F., et al., 2018, ApJ, 856, 96. 104. "First Results from the Herschel and ALMA Spectroscopic Surveys of the SMC: The Relationship between [C II]-Bright Gas and CO-bright Gas at Low Metallicity"
Jameson, Katherine E., et al., 2018, ApJ, 853, 111. 103. "High Spectral Resolution SOFIA/EXES Observations of C2H2 toward Orion IRc2"
Rangwala, Naseem, et al., 2018, ApJ, 856, 9. 102. "The Inception of Star Cluster Formation Revealed by [CII] Emission Around an Infrared Dark Cloud"
Bisbas, Thomas G., et al., 2018, MNRAS. 478, L54. 101. "Stringent Upper Limit of CH4 on Mars Based on SOFIA/EXES Observations"
Aoki, S., et al., 2018, A&A, 610, A78. 100. "Kinematics of the Horsehead Nebula and IC 434 Ionization Front in CO and C+"
Bally, John, et al., 2018, AJ, 155, 80. 99. "An Infrared Study of the Circumstellar Material Associated with the Carbon Star R Sculptoris"
Hankins, M.J., et al., 2018, ApJ, 852, 9. *55. "A Path to High-Efficiency Optical Coupling for HIRMES"
Miller, Timothy M., et al., 2018, Journal of Low Temperature Physics, 193, 681. *54. "An Overview of the Stratospheric Observatory for Infrared Astronomy Since Full Operation Capability"
Ennico, Kimberly, et al., 11/2018, JAI. *53. "The upGREAT Dual Frequency Heterodyne Arrays for SOFIA"
Risacher, C., et al., 11/2018, JAI. *52. "SOFIA - HIRMES: Looking forward to the HIgh-Resolution Mid-infrarEd Spectrometer"
Richards, Samuel, et al., 11/2018, JAI. *51. "SOFIA at Full Operation Capability: Technical Performance"
Temi, P., et al., Accepted 07/2018, JAI. *50. "EXES: The Echelon-cross-echelle Spectrograph for SOFIA"
Richter, M., et al., Accepted 07/2018, JAI. *49. "SOFIA Flight Planning and Execution"
Leppik, K., et al., Accepted 07/2018, JAI. *48. "Image Size and Control System Developments of the Airborne Telescope SOFIA"
Graf, F., et al., Accepted 07/2018, JAI. *47. "The HAWC+ Far Infrared Camera and Polarimeter for SOFIA"
Harper, Doyal A., et al., Accepted 07/2018, JAI. *46. "The SOFIA Focal Plane Imager: A Highly Sensitive and Fast Photometer for the Wavelength Range 0.4 to 1 Micron"
Pfuller, Enrico, et al., Accepted 07/2018, JAI. *45. "The SOFIA Telescope in Full Operation"
Reinacher, A., et al., Accepted 07/2018, JAI. *44. "A Review of Science Ground Operations for the Stratospheric Observatory for Infrared Astronomy (SOFIA)"
Ali, Z. A., et al., Accepted 06/2018, JAI. *43. "FORCAST: A Mid-Infrared Camera for SOFIA"
Herter, T. L., et al., 07/2018, JAI. *42. "Increasing the SOFIA Secondary Mirror Mechanism’s Fast Steering Capability by Identification of a Structural Resonance and Its Subsequent Elimination Through Mass Re-Distribution"
Lammen, Yannick, et al., 07/2018, JAI. *41. "FIFI-LS: The Field-Imaging Far-Infrared Line Spectrometer on SOFIA"
Fischer, Christian, et al., 07/2018, JAI. *40. "Spectral and Spatial Characterization and Calibration of FIFI-LS — The Field Imaging Spectrometer on SOFIA"
Colditz, Sebastian, et al., 07/2018, JAI. *39. "Characterization of Si Membrane TES Bolometer Arrays for the HIRMES Instrument"
Barrentine, E. M., et al., 05/2018, JLTP. *38. "Fabrication of Ultrasensitive TES Bolometric Detectors for HIRMES"
Brown, Ari-David, et al., 04/2018, JLTP. 98. "Simultaneous Multicolour Optical and Near-IR Transit Photometry of GJ 1214b with SOFIA"
Angerhausen, D., et al., 2017, A&A, 608, 12. 97. "The Power of SOFIA/FORCAST in Estimating Internal Luminosities of Low-mass Class 0/I Protostars"
Huard, Tracy L., et al., 2017, ApJ, 851, 2. 96. "The Detection of 6.9 μm Emission Features in the Infrared Spectra of IRAS 04296+3429, IRAS 05341+0852, and IRAS 22272+5435: Evidence for the Presence of Hn-PAHs in Post-AGB Stars"
Materese, Christopher K., et al., 2017, ApJ, 850, 2. 95. "[C I], [C II] and CO Emission Lines as a Probe for α Variations at Low and High Redshifts"
Levshakov, S. A., et al., 2017, MNRAS, 471, 2. Langer, W. D., et al., 2017, A&A, 607, 59. Herpin et al., 2017, A&A, 606, 52. 92. “[C II] Emission from L1630 in the Orion B Molecular Cloud"
Pabst et al., 2017, A&A, 606, 29. 91. "SOFIA/GREAT Discovery of Terahertz Water Masers"
Neufeld, David A. et al., 2017, ApJ, 843, 94. 90. "A SOFIA FORCAST Grism Study of the Mineralogy of Dust in the Winds of Proto-planetary Nebulae: RV Tauri Stars and SRd Variables"
Arneson, R. A. et al., 2017, ApJ, 843, 22. 89. "The SOFIA Massive (SOMA) Star Formation Survey. I. Overview and First Results"
De Buizer, J. M. et al., 2017, ApJ, 843, 27. 88. "Nature of Shocks Revealed by SOFIA OI Observations in the Cepheus E Protostellar Outflow"
Gusdorf, A.et al., 2017, A&A, 602, 8. 87. "Detection of Interstellar Ortho-D2H+ with SOFIA"
Harju, Jorma et al., 2017, ApJ, 840, 63. 86. "Oxygen Budget in Low-Mass Protostars: The NGC 1333-IRAS4A R1 Shock Observed in [O I] at 63 μm with SOFIA-GREAT"
Kristensen, L.E. et al., 2017, A&A, 601, L4. 85. "The Inner 25 au Debris Distribution in the ɛ Eri System"
Su, Kate Y. L. et al., 2017, AJ, 153, 5. 84. "Disentangling the ISM phases of the Dwarf Galaxy NGC 4214 Using [C II] SOFIA/GREAT Observations"
Fahrion, K. et al., 2017, A&A, 599, 9. 83. "SOFIA/GREAT [C II] Observations in Nearby Clouds near the Lines of Sight Towards B0355+508 and B0212+735"
Glück, C. B. et al., 2017, A&A, 600, 94. 82. "An Infrared Study of the Dust Properties and Geometry of the Arched Filaments H II Region with SOFIA/FORCAST"
Hankins, M. J. et al., 2017, ApJ, 837, 79. 81. "Jupiter's para-H2 Distribution from SOFIA/FORCAST and Voyager/IRIS 17-37 µm Spectroscopy"
Fletcher, L. N. et al., 2017, Icarus, 286, 223. 80. "A Massive Shell of Supernova-Formed Dust in SNR G54.1+0.3"
Temim, T. et al., 2017, ApJ, 836, 129. 79. "SOFIA-EXES Mid-IR Observations of [Fe II] Emission from the Extended Atmosphere of Betelgeuse"
Harper, G. M. et al., 2017, ApJ, 836, 22. 78. "Different Origins or Different Evolutions? Decoding the Spectral Diversity Among C-type Asteroids"
Vernazza, P. et al., 2017, AJ 153, 72. 77. "Massive Star Formation in the LMC. I. N159 and N160 Complexes"
Gordon, M. S. et al., 2017, ApJ 834, 122. 76. "Discovery of Broad Molecular Lines and of Shocked Molecular Hydrogen from the Supernova Remnant G357.7+0.3: HHSMT, APEX, Spitzer, and SOFIA Observations"
Rho, J., et al., 2017, ApJ 834, 12. *37. "Performance of Backshort-Under-Grid Kilopixel TES Arrays for HAWC+"
Staguhn, J. G., et al., 8/2016, JLTP, 184, 811. *36. "Superconducting Pathways Through Kilopixel Backshort-Under-Grid Arrays"
Jhabvala, C. A., et al., 08/2016, JLTP, 184, 615. *35. "Parallel Adaptive High-Order CFD Simulations Characterising SOFIA Cavity Acoustics"
Barad,M.F., et al., 07/2016, IJCFD, 30, 437. 75. "Evidence from SOFIA Imaging of Polycyclic Aromatic Hydrocarbon Formation Along a Recent Outflow in NGC 7027"
Lau, R. M. et al., 2016, ApJ 833, 115. 74. "Disk-Mediated Accretion Burst in a High-Mass Young Stellar Object"
Caratti O Garatti, A., et al., 2016, Nature Physics, 13, 276. *34. "The upGREAT 1.9 THz Multi-Pixel High Resolution Spectrometer for the SOFIA Observatory"
Risacher, C., et al., 2016, A&A, 595, 34. 73. "The Mid-Infrared Evolution of the FU Orionis Disk"
Green, J. D., et al., 2016, ApJ 832, 4. 72. "The Orion HII Region and the Orion Bar in the Mid-Infrared"
Salgado, F. et al., 2016, ApJ 830, 118. 71. "Infrared Observations of the Quintuplet Proper Members using SOFIA/FORCAST and Gemini/TReCS"
Hankins, M.J. et al., 2016, ApJ 827, 136. 70. "Investigating the Dusty Torus of Seyfert Galaxies Using SOFIA/FORCAST Photometry"
Fuller, L. et al., 2016, MNRAS 462, 2618. 69. "Comparing [C II] , HI, and CO Dynamics of Nearby Galaxies"
deBlok, W. J. G. et al., 2016, AJ, 152, 51. 68. "L1599B: Cloud Envelope and C+ Emission in a Region of Moderately Enhanced Radiation Field"
Goldsmith, Paul F. et al., 2016, ApJ 824, 141. 67. "[C II] 158 μm and [N II] 205 μm Emission from IC 342. Disentangling the Emission from Ionized and Photo-Dissociated Regions"
Röllig, M. et al., 2016 A&A, 591, A33. 66. "SOFIA Mid-Infrared Imaging and CSO Submillimeter Polarimetry Observations of G034.43+00.24 MM1"
Jones, T. J. et al., 2016, AJ, 151, 156. 65. "Mapping PAH Sizes in NGC 7023 with SOFIA"
Croiset, B. A. et al., 2016, A&A, 590, A26. 64. "Carbon Gas in SMC Low-Metallicity Star-Forming Regions"
Requena-Torres et al., 2016, A&A, 589, A28. 63. "An Apparent Precessing Helical Outflow from a Massive Evolved Star: Evidence for Binary Interaction"
Lau. R. M. et al., 2016, ApJ, 818, 117. *33. "First Supra-THz Heterodyne Array Receivers for Astronomy With the SOFIA Observatory"
Risacher, C.,et al., 03/2016, TITTST, 6, 199. 62. "Searching for Cool Dust in the Mid-to-Far Infrared: The Mass-Loss Histories of the Hypergiants μ Cep, VY CMa, IRC+10420, and ρ Cas"
Shenoy, D., et al., 2016, AJ, 151, 51. 61. "A Map of D/H on Mars in the Thermal Infrared Using EXES Aboard SOFIA"
Encrenaz, T, et al., 2016, A&A, 586, A62. *32. "The Physics of Water Masers Observable with ALMA and SOFIA: Model Predictions for Evolved Stars"
Gray, M. D., et al., 2016, MNRAS, 456, 374. 60. "Infall Through the Evolution of High-Mass Star-Forming Clumps"
Wyrowski, F., et al., 2016, A&A, 585, A149. 59. "Far-Infrared Study of Tracers of Oxygen Chemistry in Diffuse Clouds"
Wiesemeyer, H., et al., 2016, A&A, 585, A76. 58. "Challenging Shock Models with SOFIA OH Observations in the High-Mass Star-Forming Region Cepheus A"
Gusdorf, A., et al., 2016, A&A, 585, A45. *31. "Superconducting Hot-Electron Bolometer: from the Discovery of Hot-Electron Phenomena to Practical Applications"
Shurakov, A., et al., 01/2016, SuScT, 29, 2. 57. "Spectroscopically Resolved Far-IR Observations of the Massive Star-Forming Region G5.89-0.39"
Leurini, S., et al., 2015, A&A, 584, A70. 56. "SOFIA/FORCAST Observations of Warm Dust in S106: A Fragmented Environment"
Adams, J. D., et al., 2015, ApJ, 814, 54. 55. "Disentangling the Excitation Conditions of the Dense Gas in M17 SW"
Pérez-Beaupuits, J. P., et al., 2015, A&A, 583, A107. 54. "The Early Infrared Temporal Development of Nova Delphini 2013 (V339 DEL) Observed with the Stratospheric Observatory for Infrared Astronomy (SOFIA) and from the Ground"
Gehrz, R. D., et al., 2015, ApJ, 812, 132. 53. "The Structure of the Cepheus E Protostellar Outflow: The Jet, the Bowshock, and the Cavity"
Lefloch, B., et al., 2015, A&A, 581, A4. 52. "SOFIA Infrared Spectrophotometry of Comet C/2012 K1 (Pan-STARRS)"
Woodward, C. E., et al., 2015, ApJ, 809, 181. 51. "First Detection of the 63 μm Atomic Oxygen Line in the Thermosphere of Mars with GREAT/SOFIA"
Rezac, L., et al., 2015, A&A, 580, L10. 50. "Fine-Structure Line Deficit in S 140"
Ossenkopf, V., et al., 2015, A&A, 580, A83. 49. "Temperatures of Dust and Gas in S 140"
Koumpia, E., et al., 2015, A&A, 580, A68. 48. "Velocity Resolved [C II], [C I], and CO Observations of the N159 Star-Forming Region in the Large Magellanic Cloud: A Complex Velocity Structure and Variation of the Column Densities"
Okada, Y., et al., 2015, A&A, 580, A54. 47. "Witnessing the Emergence of a Carbon Star"
Guzman-Ramirez, L., et al., 2015, MNRAS, 451, L1. 46. "SOFIA Observations of SN 2010jl: Another Non-Detection of the 9.7 μm Silicate Dust Feature"
Williams, B. J., & Fox, O. D., 2015, ApJ, 808, L22. *30. "4.7-THz Local Oscillator for the GREAT Heterodyne Spectrometer on SOFIA"
Richter, H., et al., 07/2015, ITTST, 5, 539. 45. "High Spectral and Spatial Resolution Observations of the PDR Emission in the NGC 2023 Reflection Nebula with SOFIA and APEX"
Sandell, G., et al., 2015, A&A, 578, A41. 44. "Sulphur-Bearing Molecules in Diffuse Molecular Clouds: New Results from SOFIA/GREAT and the IRAM 30 m Telescope"
Neufeld, D. A., et al., 2015, A&A, 577, A49. 43. "Observations of Type Ia Supernova 2014J with FLITECAM/SOFIA"
Vacca, W. D., et al., 2015, ApJ, 804, 66. 42. "Old Supernova Dust Factory Revealed at the Galactic Center"
41. "SOFIA/EXES Observations of Water Absorption in the Protostar AFGL 2591 at High Spectral Resolution"
40. "Ionized Gas at the Edge of the Central Molecular Zone"
Langer, W. D., et al., 2015, A&A, 576, A1. 39. "Impacts of Pure Shocks in the BHR71 Bipolar Outflow"
Gusdorf, A., et al., 2015, A&A, 575, A98. 38. "Detection of a Large Fraction of Atomic Gas Not Associated with Star-Forming Material in M17 SW⋆"
Pérez-Beaupuits, J. P, et al., 2015, A&A, 575, A9. 37. "First Exoplanet Transit Observation with the Stratospheric Observatory for Infrared Astronomy: Confirmation of Rayleigh Scattering in HD 189733 b with HIPO"
Angerhausen, D., et al., 2015, J. Astron. Telesc. Instrum. Syst. 1(3), 034002. 36. "H2D+Observations Give an Age of at Least One Million Years for a Cloud Core Forming Sun-Like Stars"
Brünken, S., et al., 2014, Nature, 516, 219. 35. "Carbon in Different Phases ([CII], [CI], and CO) in Infrared Dark Clouds: Cloud Formation Signatures and Carbon Gas Fractions"
Beuther, H., et al., 2014, A&A, 571, AA53. 34. "Dusty Cradles in a Turbulent Nursery: The Sgr A East H II Region Complex at the Galactic Center"
Lau, R. M., et al., 2014, ApJ, 794, 108. 33. "A Far-IR View of the Starburst-Driven Superwind in NGC 2146"
Kreckel, K., et al., 2014, ApJ 790, 26. *29. "The SOFIA Observatory at the Start of Routine Science Operations: Mission Capabilities and Performance"
Temi, P., et al., 2014, ApJS, 212, 24. 32. "Nature Versus Nurture: Luminous Blue Variable Nebulae in and Near Massive Stellar Clusters at the Galactic Center"
Lau, R. M.; Herter, T. L.; Morris, M. R.; Adams, J. D., 2014, ApJ, 785, 120. 31. "Mid-Infrared Imaging of the Bipolar Planetary Nebula M2-9 from SOFIA"
Werner, M. W., et al., 2014, ApJ, 780, 156. *28. "Data Reduction and Early Science Calibration for FORCAST, A Mid-Infrared Camera for SOFIA"
Herter, T. L., et al., 11/2013, PASP, 125, 1393. *27. "SOFIA, an Airborne Observatory for Infrared Astronomy"
Krabbe, A., et al., 11/2013, EJPh, 34, 6. 30. "The 2011 June 23 Stellar Occultation by Pluto: Airborne and Ground Observations"
Person, M. J., et al., 2013, AJ, 146, 83. 29. "SOFIA/FORCAST Imaging of the Circumnuclear Ring at the Galactic Center"
Lau, R. M., et al., 2013, ApJ, 775, 37. *26. "SOFIA: First Science Highlights and Future Science Potential"
Zinnecker, H., 2013, AN, 334, 558. 28. "A Massive Protostar Forming by Ordered Collapse of a Dense, Massive Core"
Zhang, Y., et al., 2013, ApJ, 767, 58. *25. "Worldwide Site Comparison for Submillimetre Astronomy"
Tremblin et al., 2012,A&A, 548, A65. 27. "SOFIA/FORCAST and Spitzer/IRAC Imaging of the Ultracompact H II Region W3(OH) and Associated Protostars in W3"
Hirsch, L., et al., 2012, ApJ, 757, 113. 26. "CARMA CO(J = 2 – 1) Observations of the Circumstellar Envelope of Betelgeuse"
O'Gorman, E., et al., 2012, AJ, 144, 36. Guan, X., et al., 2012, A&A, 542, L4. *23. "High-Resolution Wide-Band Fast Fourier Transform Spectrometers"
Klein, B., et al., 2012, A&A, 542, L3. *22. "Terahertz Hot Electron Bolometer Waveguide Mixers for GREAT"
Pütz, P., et al., 2012, A&A, 542, L2. *21. "GREAT: The SOFIA High-Frequency Heterodyne Instrument"
Heyminck, S., et al., 06/2012, A&A, 542, L1. 25. "[CII] Gas in IC 342"
Röllig, M., et al., 2012, A&A, 542, L22. 24. "GREAT Confirms Transient Nature of the Circum-nuclear Disk"
Requena-Torres, M. A., et al., 2012, A&A, 542, L21. 23. "Probing the Mass and Structure of the Ring Nebula in Lyra with SOFIA/GREAT Observations of the [CII] 158 Micron Line"
Sahai, R., et al., 2012, A&A, 542, L20. 22. "Probing Magnetohydrodynamic Shocks with High-J CO Observations: W28F"
Gusdorf, A., et al., 2012, A&A, 542, L19. 21. "Globules and Pillars Seen in the [CII] 158 μm Line with SOFIA"
Schneider, N., et al., 2012, A&A, 542, L18. 20. "The Structure of Hot Gas in Cepheus B"
Mookerjea, B., et al., 2012, A&A, 542, L17. 19. "[12C II] and [13C II] 158 μm Emission from NGC 2024: Large Column Densities of Ionized Carbon"
Graf, U. U., et al., 2012, A&A, 542, L16. 18. "Terahertz Ammonia Absorption as a Probe of Infall in High-Mass Star Forming Clumps"
Wyrowski, F., et al., 2012, A&A, 542, L15. 17. "GREAT [C II] and CO Observations of the BD+40°4124 Region"
Sandell, G., et al., 2012, A&A, 542, L14. 16. "The Ionized and Hot Gas in M17 SW. SOFIA/GREAT THz Observations of [C II] and 12CO J = 13-12"
Pérez-Beaupuits, J. P., et al., 2012, A&A, 542, L13. 15. "SOFIA Observations of S106: Dynamics of the Warm Gas"
Simon, R., et al., 2012, A&A, 542, L12. 14. "SOFIA Observations of CO (12-11) Emission Along the L1157 Bipolar Outflow"
Eislöffel, J., et al., 2012, A&A, 542, L11. 13. "Dynamics and Photodissociation Region Properties in IC 1396A"
Okada, Y., et al., 2012, A&A, 542, L10. 12. "High-J CO Emission in the Cepheus E Protostellar Outflow Observed with SOFIA/GREAT"
Gómez-Ruiz, A. I., et al., 2012, A&A, 542, L9. 11. "SOFIA Observations of Far-infrared Hydroxyl Emission Toward Classical Ultracompact HII/OH Maser Regions"
Csengeri, T., et al., 2012, A&A, 542, L8. 10. "High-Resolution Absorption Spectroscopy of the OH 2Π3/2Ground State Line"
Wiesemeyer, H., et al., 2012, A&A, 542, L7. 9. "Discovery of Interstellar Mercapto Radicals (SH) with the GREAT Instrument on SOFIA"
Neufeld, D. A., et al., 2012, A&A, 542, L6. 8. "Detection of OD towards the low-mass protostar IRAS 16293-2422"
Parise, B., et al., 2012, A&A, 542, L5. 7. "First Science Observations with SOFIA/FORCAST: Properties of Intermediate-Luminosity Protostars and Circumstellar Disks in OMC-2"
Adams, J. D., et al., 2012, ApJ, 749, L24. 6. "First Science Observations with SOFIA/FORCAST: 6-37 μm Imaging of Orion BN/KL"
De Buizer, J. M., et al., 2012, ApJ, 749, L23. 5. "First Science Observations with SOFIA/FORCAST: 6-37 μm Imaging of the Central Orion Nebula"
Shuping, R. Y., et al., 2012, ApJ, 749, L22. 4. "First Science Results from SOFIA/FORCAST: The Mid-Infrared View of the Compact H II Region W3A"
Salgado, F., et al., 2012, ApJ, 749, L21. 3. "First Science Results from SOFIA/FORCAST: Super-Resolution Imaging of the S140 Cluster at 37 μm"
Harvey, P. M., et al., 2012, ApJ, 749, L20. 2. "Mid-IR FORCAST/SOFIA Observations of M82"
Nikola, T., et al., 2012, ApJ, 749, L19. *20. "First Science Observations with SOFIA/FORCAST: The FORCAST Mid-Infrared Camera"
Herter, T. L., et al., 2012, ApJ, 749, L18. *19. 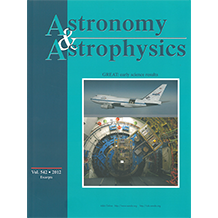 "Early Science with SOFIA, the Stratospheric Observatory For Infrared Astronomy"
Young, E. T., et al., 2012, ApJ, 749, L17. *18. "Status of the Stratospheric Observatory for Infrared Astronomy (SOFIA)"
Gehrz, R. D., et al., 2011, AdSpR, 48, 1004. 1. "EPOXI: Comet 103P/Hartley 2 Observations from a Worldwide Campaign"
Meech, K. J.., et al., 2011, ApJ, 734, L1. *17. "Observing Exoplanets with SOFIA"
Angerhausen, D., Krabbe, A., & Iserlohe, C., 2010, PASP, 122, 1020. *16. "A new window on the cosmos: The Stratospheric Observatory for Infrared Astronomy (SOFIA)"
Gehrz, R. D., et al., 2009, AdSpR, 44, 413. *15. "A Survey of 3.3 μm PAH Emission in Planetary Nebulae"
Smith, E. C. D., & McLean, I. S., 2008, ApJ, 676, 408. *14. "Investigation of PAHs in Planetary Nebulae Using FLITECAM"
Smith, E. C., 2008, PhDT. *13. "A low noise 2 × 16 Ge:Sb Focal-Plane Array: Paving the Way for Large Format FPAs for Far IR Astronomy"
Farhoomand, J., et al., 10/2007, InPhT, 51, 102. *12. "Compact 1.9 THz BWO Local-Oscillator for the GREAT Heterodyne Receiver"
Philipp, M., et al., 07/2007, InPhT, 51, 54. *11. "Low Noise 1 THz-1.4 THz Mixers Using Nb/Al-AlN/NbTiN SIS Junctions"
Karpov, A., et al., 06/2007, ITAS, 17, 343. *10. "A Simple Method to Design Astigmatic Off-Axis Mirrors"
Wagner-Gentner, A., et al., 03/2007, InPT, 50, 42. *9. "Analytical Model for Flow-Excited Interior Cavity Resonance and its Application to the Stratospheric Observatory for Infrared Astronomy (SOFIA)"
Ginsberg, J.H., 11/2006, ASAJ, 120, 3286. *8. "A Simple Method to Design Astigmatic Off-Axis Mirrors"
Becklin, E. E., et al., 00/2006, MPLA, 21, 2551. *7. "A Simple Model for Coupled Acoustic-Structure Resonance in Stratospheric Observatory for Infrared Astronomy"
Ginsberg, J.H., et al., 04/2005, ASAJ, 117, 2455. Page, R.D., et al., 05/2003, NIMPB, 204, 634. *5. "THIS: A Tuneable Heterodyne Infrared Spectrometer"
Wirtz, D., et al., 09/2002, AcSpA, 58, 2457. *4. "The HAWC and SAFIRE Adiabatic Demagnetization Refrigerators"
Tuttle, J., et al., 11/2001, Cryo, 41, 781. *3. "Magnetic Shielding for Sensitive Detectors"
Tuttle, J., et al., 05/2001, Cryo, 41, 401. *2. "Multiplexed Readout of Superconducting Bolometers"
Benford, D.J., et al., 2000, IJIMW, 21, 1909. *1. "Stratospheric Observatory for Infrared Astronomy (SOFIA)"
Becklin, E.E., et al., 2000, LNP,548, 416.